Birds and airports don't mix well. Though the risk to human passengers and pilots is minimal, when bird-airplane collisions do occur, they often result in the loss of avian life. For years, airports have tried a variety of solutions to scare off birds, with some choosing relatively humane methods -- such as firecrackers -- and others taking deadlier actions, like shooting snowy owls. But a Dutch design company, Clear Flight Solutions, believes it has a quiet, nonlethal answer: robots that mimic birds of prey with uncanny accuracy. Remotely controlled from the ground, a flapping "robird" can shepherd real birds out air traffic's way. It's similar to the way a few airports use trained peregrine falcons as live scarecrows, but these battery-powered robots offer a more predictable bird deterrent. The faux falcons are now in a pilot stage, and have successfully scared away about 75 percent of wild birds from a few test sites. "From a biological point of view, the thing that triggers a bird's instinct about a predator is the combination of silhouette and wing movement," says Clear Flight Solutions CEO Nico Nijenhuis, to Audubon Magazine. 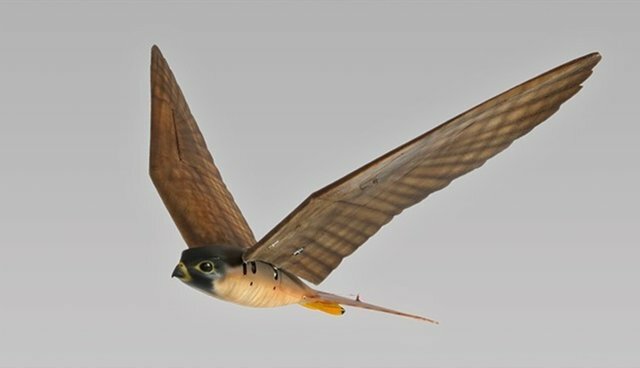 Thanks to carefully constructed foam wings attached to 3-D printed bodies, the robirds do an impressive job playing their predatory part, executing the swift swoops and dips of a raptor's flight pattern. Airports will have to wait a little bit before these robots can take flight -- Clear Flight Solutions plans to commercially launch its robirds next year.